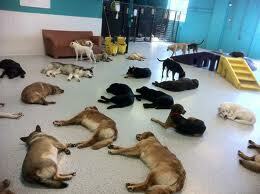 Doggy Day Care and Night Care in Phoenix! 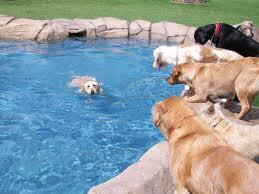 We research and list a selection of doggy day care with good reviews in Phoenix. 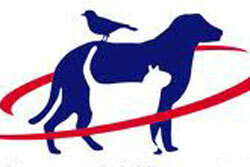 **Be sure pet is up-to-date on ALL vaccinations before boarding** and that you have all your paperwork! 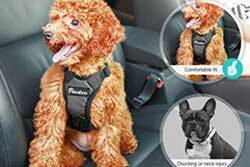 Get a Groupon Pet Care Deal for Phoenix! Looking for pet care in Phoenix for Grooming and Boarding? Get a Groupon for boarding! Get a Groupon for grooming! Deer Creek Animal Hospital Boarding- Dogs participate in group activities, go outside to play multiple times a day, and receive one-on-one interaction with staff members. They thoroughly enjoy each visit to our resort. Deer Creek Resort is your pet's premier vacation destination. 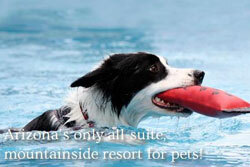 The canine resort features spacious, climate controlled runs, multiple outings daily in cabana area. Provides dog boarding, cat boarding, resort activities, doggie day care, special needs care, & grooming services. All pets are different. Some crave lots of activity, and some just want to spend time with people. We want each of our guests to feel comfortable with his or her level of activity so your pet's time away from you is filled with the right attention and playtime he or she needs. Dog boarding facility with grooming services, dogs kept separate from each other for safety of the pets, on site staff 24/7. Tailwinds Pet Resort is renowned for offering a variety of Phoenix Pet care services and Pet resort options for your beloved furry friends in the heart of central Phoenix. Our professional staff is on hand to make sure Pet guests are comfortable, well-attended to, and have fun playing and exercising appropriately. Pet sitting services including daily pet care visits, veterinary experience, overnight & live-in care, pet transportation, pet waste removal, hotel room pet care, as well as dog walking, running, & outings.